The famous Antwerp Hands are a traditional gift and an official Antwerp quality product. This large luxury box contains 24 hands made from artisan chocolate. 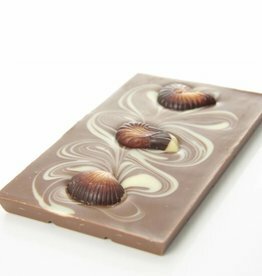 The milk and dark chocolate hands (8 pieces each) are filled with a delicious almond marzipan and a hint of Elixir d' Anvers, a traditional liquor from Antwerp. The white chocolate hands (8 pieces) are filled with a creamy hazelnut praline.